My spouse and I are planning to camp in Big Bend National Park in late December. Meanwhile, there are lots of news stories about the "migrant caravan" heading for the US border, the troops deployed to fend them off, etc., etc. Is it still safe to camp there? I'm a little worried about the possibility of getting caught in the middle of a conflict between migrants and soldiers. I would not worry about Trump's political posturing. The very idea of sending troops to the border now, when they still have no idea where this caravan is going to end up, is kind of silly. That said, there are migrants and others crossing (illegally) every day. But Big Bend National Park is well away from the established migration routes. 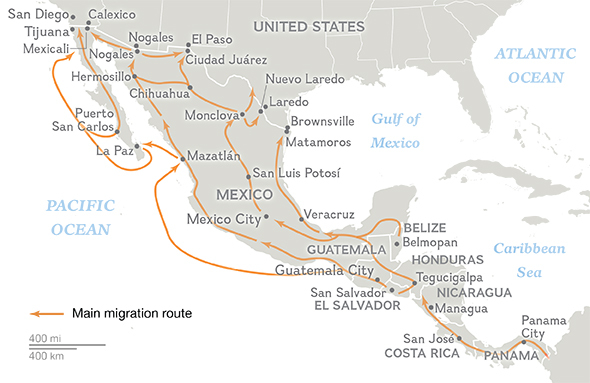 This map published by National Geographic shows the common migration paths through Mexico. As you can see, Big Bend National Park is well away from the commonly used routes. This is largely because of the inhospitable yet beautiful terrain that presumably you're going there to see. I wouldn't worry too much about running into migrants or soldiers. If something does happen, park rangers at the park will provide relevant information at the park, and it will also be posted on the NPS web site. Not the answer you're looking for? Browse other questions tagged usa safety camping national-parks texas or ask your own question. How safe is traveling from Texas to Mexico by bus?